This is my test instance. It was Frappe v10 before. I switched the branch and stuff. I mean, I don’t see any changes ; I think , I need ERPNext v11 for updated features. How can I achieve that? I’m also willing to start from scratch. First it has been recommended that both your apps should be on the same branch i.e. master or staging. Also, one thing to note is v11 features have not yet been merged into master. SO to try them out you’ll have to switch to staging branch. I recommend that If you are testing v11 then make a new site and try those changes there in your development server or PC. Then try bench switch-to-branch staging and bench update --patch to get it done. Then try bench switch-to-branch staging and bench update --patch to get it done. Getting “Branch staging does not exist in Upstream for erpnext” in the 2nd step. Make sure it fetches all branches on upstream and not only develop or master. @chdecultot How do I make sure to fetch all branches on upstream? 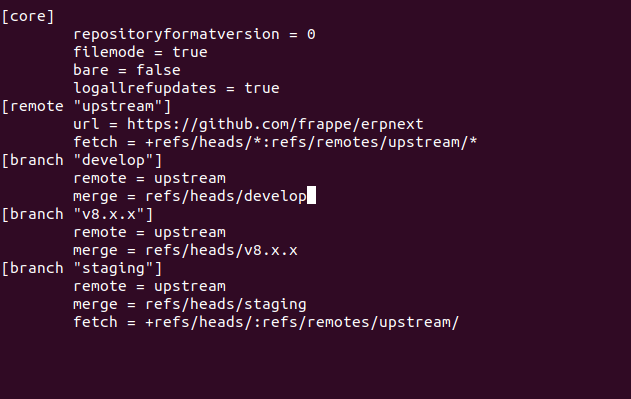 I can switch Frappe to staging but for ERPNext it says, doesn’t exist on upstream! In case you can’t fetch the staging branch, execute this command from the app’s directory: git config remote.upstream.fetch "+refs/heads/*:refs/remotes/upstream/*" This will configure git to fetch all branches from upstream. Then run git fetch upstream to fetch staging branch. Thanks @snv. I already did. Using the Staging now; testing. Getting errors after saving stuffs. Hopefully a master version will be released soon. @snv solution is the correct one. If it’s still not working check the .git/config file directly in the erpnext folder. If correctly configured (like in @snv post) you should be able to make a git fetch and fetch the staging branch. It’s strictly a git issue, so maybe you can find some help by making some git tutorials or looking in Google in reference to the error generated by the git command. Maybe you can post your issues with the staging branch? You may not be the only one facing these issues. You need to edit it as below. Frappe and ERPNext should both be on Staging. Had the same issue till I fixed the config file. Since then now more problems. ignore npm if it throws any error. Just realized that for some reason the * go missing in the code. So heres the picture of the code that should be there. Migrate from v10 to v11, what do i miss? I followed your procedure, not able to set erpnext to staging from master. it’s very difficult for the layperson to manage this… I’m sticking with Version 10 until a proper upgrade path exists. yarn error "EACCESS: permission denied, scandir '/home/ubuntu/.config/yarn/link'"